Slow Down London is here and stirring up debate. Just what exactly does 'slow' mean in the dizzying dance of London life? Taken literally, annoyance; those spitting, swearing commuters on Friday weren't having any of it. Our Flickr friends, on the other hand, showed a fascinating breadth of approach to the brief of capturing the essence of slow down London for us. We went along to find out more about slow from people who know at Foyles last night. Last night's free opportunity to hear two quite different perspectives on slowing down really made 'slow' real for us for the first time. The charming Italian Bruno Contigiani, director of the ‘Art of Slow Living’ was first up, replete with bare feet in Crocs (ever tried to dash anywhere in those things?) He consistently refused to give advice about slowing down, emphasising that it's a very personal, lifestyle choice. This man gives out speeding tickets to pacey pedestrians to help them think about theirs, a list of 'Slowmandments' on the back, suggesting simple ways to challenge their hectic routine. Time and again, Bruno returned to kindness as being at the heart of slow; smiling at strangers, saying hello, really listening to people. Being kind to oneself as well - preventing situations where you simply don't have the time, saying no to things and making sure you do things that really make you happy. Simple stuff, yet how many times do you find yourself saying yes to another activity when you'd rather be under the duvet with a good book? From speeding tickets to a vehicle that couldn't break a speed limit despite weighing 2 tonnes and veering downhill loaded with a trio of loafers. 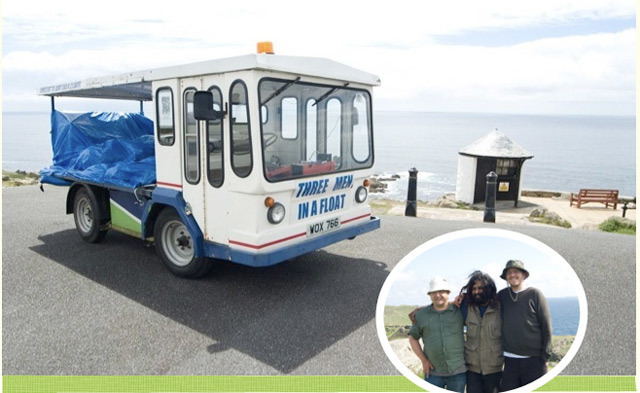 The Three Men in a Float put the notion of slow travel to an apparently impractical test, traversing England from Lowestoft to Lands End in a 1958 electric milk float two years ago. Completing the 600 odd miles in around three and half weeks, the boys admitted to having felt like they'd rushed it by the end - the point being that with a maximum speed of 15mph, the need to recharge every 20 miles and not a lot between you and the open countryside, your whole world slows right down as your horizon extends infinitely ahead of you. Their laid back banter charmed us with the kindness of strangers, being overtaken by rabbits, their inability to bear a 40 car tailback, a whole string of serendipitous happenings, "milkman's arse" and the unforeseen hazards of driving an electric vehicle through fords and wiring into the live electrical sockets of cookers, lamp posts and campsites. Their ambling and eccentric adventure gave the opportunity to drop the veil of cynicism that modern, urban life deems so normal in order to pay close attention to the (stunningly beautiful) landscape around them and to engage with the locals encountered along the way. Inspired and amused, we were left wondering if it would take a milkfloat to enable abandoning the pace and preoccupation of London but the 'Three Men...' merely invite us to readjust our expectations of travel - it's about getting there, not arriving, however you choose to do it. Continue the slow vibe and join us for the private view of Londonist Presents: Slow Exposure at Ray's Jazz Cafe, Foyles, Charing Cross Road between 6-8.30pm on Friday 1st May. RSVP londonist@gmail.com. Help us with our slow playlist for the evening here. Slow Down London continues with a whole range of chilled out, intriguing and relaxing events until 4 May.